I asked Dr. Teruhiko Wakayama, who goes by Teru to those who know him, if he would be willing to do a Q&A on the STAP stem cell situation. Teru was senior author on the STAP stem cell Nature letter on chimerism, but was not a senior (note this is a correction from an earlier version of this post) author on the other STAP paper, the Nature article on the production of STAP stem cells. Teru kindly agreed to my invitation. He responded straightforwardly to what I thought were direct and sometimes tough questions. He also lays out a reasonable plan for STAP looking to the future. Thank you, Teru. To me his answers reflect his great reputation as both a scientist and person. Teru is a true good citizen of the stem cell field. Teru is what I would call a “mensch”. I fully support Teru’s proposal that we give STAP stem cells a year to be reproduced. 1. How did the STAP stem cell collaboration begin between the Vacanti lab and your group? What made you decide to team up with them? Can you please tell us more about the beginnings of this research? Teru: Dr. Kojima (Vacanti’s lab) contacted me by e-mail to help with chimera experiments. At that time, the project looks very much impossible. That’s why I accepted. I like such impossible experiments. First time, Dr. Obokata brought strange cells, and there was no chimera after blastocyst injection. However, nearly 2 year later, Dr. Obokata found a very good method to generate STAP cell. Then, we could obtain good chimera. 2. Have you talked to Drs. Vacanti and Obokata recently? How did that talk go? If they are not talking, why is that so? Teru: I have not talked to Dr. Vacanti. I had a talk with Dr. Obokata, but in Japan, the main problem is, not reproducibility, it is the mistakes of picture or band. Now RIKEN and outside people investigate that problem. But she said that in her lab, she can create STAP cell. 3. What is your own level of confidence in STAP cells at this point? Are you getting more concerned? Teru: Before I left RIKEN, I succeeded to make STAP cell from spleen. But only 1 time. At that time, Dr. Obokata taught me very well. Now, some of my friends (not Japan) sent me e-mails, which, reported partial success (Oct expression only). Therefore I believe that within one year, someone will publish about STAP generation. 4. Like most people, I am convinced that the mouse studies on STAP are solid and convincing. You personally have a top-notch reputation as a scientist around the world. People are instead more specifically concerned about the STAP stem cells themselves. One of the most common questions I am getting asked at this point is this–could the STAP cells have been contaminated with either mESCs or mouse iPS cells? Is that possible? How might that have happened? Teru: Thank you for your comment. I established STAP-SC several times from STAP. It is unlikely that contamination would always have happened. In addition, we established STAP-SC from 129B6GFP mice. At that time, we did not have this strain ES cell. When I succeeded to establish STAP-SC, the original STAP cells expressed Oct4-GFP very much. In this condition, the establishment is much easier than ES cell establishment from blastocyst. In addition, whole mRNA expression data suggest that STAP-SC are not ES cell. 5. You mentioned that STAP stem cell is not working in your new lab. Why do you think that might be in terms of the methods? What is different now? Also, you mentioned that STAP worked for you when you were at RIKEN. Can you please be a bit more specific? Did you do 100% of the steps in the STAP induction yourself? Again, could iPS cells or ES cells somehow have gotten into the culture? Teru: I just learned one time from Dr. Obokata, then left RIKEN. Do you know when we moved to a different lab in the past, how difficult it was then to reproduce even my own techniques? When I moved from Hawaii to Rockefeller, I spent half a year to reproduce cloned mice. This is my technique, but I still needed a lot of time. However, the method of STAP generation is not my technique, therefore, different lab and not my discovered techniques, so this is understandably more difficult to reproduce again. I did 100% by myself, but each step was looked by Dr. Obokata. Much the same, one of my PhD student also succeeded to establish STAP-SC. In those early stages of the experiment, we did not culture ES cell nor iPS cell at same time. After that, as control, we sometimes culture ES cell at same time. 6. Many people are trying the STAP method around the world and getting frustrated because it isn’t working. I know there is a methods paper in the works, but given how important this is would you consider putting a detailed step-by-step protocol out to the scientific community right now? For example, I’d be happy to post it on my blog and it would have no effect on the publication of a methods paper in a journal. This might really help people to get it to work. Waiting a month or two for a methods paper to come out might be too late. 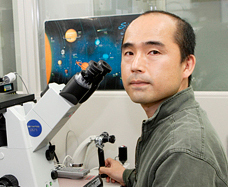 Teru: Yes, now RIKEN will soon publish the detailed method. I contributed chimera and to establishment. However, chimera and establishment is usual protocol, not specific, because it is the same or more easier than ES cell. Unfortunately, now all responsibility is in RIKEN, and I left RIKEN. Although I want to know but I do not know now. Finally–Do you have any other questions or concerns that I did not ask but that you want to address? If so please add more. Teru: I do not escape. Because in my results everything is true. However, it is going to take time to reproduce the new technique. For example, the first cloned animal, Dolly, wasn’t reproduced for one and half years after it was published. Human cloned ES cell paper has still not yet been reproduced. Therefore, please wait at least one year. I believe that during this period someone or myself will success to reproduce it. Note: At his request, I have made a scattering of small corrections to Teru’s answers just for a few typos/spelling/grammar issues since English is not his first language, but I did not change in any way the tone or significant content of his answers. I also notice that Dr. Wakayama is a listed as a co-inventor on the Vacanti et al. patent. Inventors: VACANTI, Charles A.; (US). By: Obokata, H.; Wakayama, T.; Kojima, K.; et al. By: Wakayama, Sayaka; Kohda, Takashi; Obokata, Haruko; et al. The patent application obviously is related to the Nature paper. Are the abstract and the CELL STEM CELL paper related closely to the work in the Nature paper? I have been impressed by Dr.Teru, who is honest with scientific mind. Other than the content of the paper, the problem on this case is that none of Riken seems accountable after some discrepancies had been pointed out. If there were such researcher like Dr.Teru in Riken, people would be more confident (or confortatble even with different opinions) on the paper, even though some uncertainty remains. Right. RIKEN SHOULD BE ACCOUNTABLE FOR THIS MATTER IMMEDIATERY! The world is very much frustrated by the irritating attitude of RIKEN. don’t leave out harvard, bub. XXXXXX The authors’ work from 2004-2005 has also been questioned. Irritates me that people are trying to defend Harvard, when this entire fiasco was CLEARLY engineered by them. i am also doubtful the reviewers used in vetting these articles were legitimate reviewers. I don’t think any elite scholar would accept these works in Nature in clear conscience. Is it *that* unreasonable to suggest that there exist pseudo-scholars, complete with email addresses and office spaces, that are invited by editors to review contentious articles (like this)? I don’t think so, because it’s been a common trend with other innovations to come out of Harvard. I am betting the entire review process at Nature is corrupt, and the reviewers involved in questionable papers like this are the ones who should be exposed. It’s a bit simplistic just to blame Riken for a poor follow-up to the questions about the Obokata et al papers, because the suboptimal handling of this ongoing incident reflects much deeper structural problems, both in Japan and in the scientific community in this field. The above isn’t meant as a criticism of Riken, but as a general observation. Any research institution would be in a similar position. There ought to be a standing third-party body to investigate such cases, but the Japanese government still hasn’t set one up, despite the large number of problems that have arisen in Japan recent years (see http://retractionwatch.com/ , for example). So every case is handled in an ad hoc matter. Second, as far as I know, under the present Japanese system, the only way to investigate possible problems in a scientific paper is to set up an investigating committee under the compliance procedures of the author’s institution (the same procedures as for investigating charges of misconduct in general). Once that happens, a lid is legally placed on comment until the final report is released, which seems only reasonable because the researcher being investigated is entitled to due process. This is very frustrating for the scientific community, but I think this is true in every country, not just Japan. Third, as far as I know, despite its mammoth size, Riken is set up like a university and there is no pre-submission internal approval procedure at Riken. This is a tricky area because putting such a procedure in place would slow down publication and could also infringe on academic freedom. On the other hand….. Finally, “the system” seems to treat co-authors of problematic papers leniently, while throwing their junior colleagues under the bus. The people best in a position to sniff out potential problems, both of sloppiness and outright misconduct, are the senior co-authors, and their feet should be held to the fire a bit more. I have a modest suggestion for what Nature and other journals could do. Right now, whenever a paper is submitted to a journal’s home page the submitter clicks a button saying all the co-authors are OK. My proposal is that from now on the submitted paper should be put on hold. An email giving a link to the final submitted manuscript should be sent to each co-author, and only after they all have read the manuscript and approved it should editorial processing proceed. That might incentivize co-authors to be more selective in what they put their names on, and also to be more careful in checking the manuscripts. The present system where you can be a “co-author” of a paper that you didn’t even read is a little bit mind-blowing if you really stop to think about it. Maybe the results will be replicated eventually. But the specific problem there is that one of the main selling points was how easily this method could supposedly be reproduced. We now KNOW this claim isn’t true, whatever else does or doesn’t happen with STAP cells. I agree. The RIKEN team ran a flashy press conference where they emphasized how easy it is to prepare and how versatile their STAP cells are, and how their cells are superior to iPS cells and so on. Dr. Obokata even went on to brag that STAP cells may some day enable them to reverse aging process. It was almost like they just won a Nobel prize. Dr. Wakayama’s accounts here and elsewhere directly contradict the message transmitted at that press conference. Yet Dr. Wakayama was sitting there smiling, without casting a bit of sense of reality that he now seems to be trying to convey while everyone at RIKEN remains silent. I think this is a textbook case to teach students why NOT to oversell your scientific claims, be it in a paper, at a talk at a scientific conference, or in front of TV cameras. Looking at the pics I see the same problem, but then I have never worked with placenta. Can someone who has please address this question? If the circular region had to be extracted by cut-and-paste to create a composite image then it would seem that we have someone going hog-wild with Photoshop to manufacture data for their paper, and the credibility of the work goes to zero. If this concern is misplaced, then it’s still reasonable that there is an innocent explanation and the central findings have merit. So, which is it? An anonymous blogger in Japan, Juuichigen-san (which means 11 dimensions) has gathered up all the problems of Obokota et al.’s various papers into one handy summary (in Japanese). Even if you can’t read Japanese the gist should be obvious and most of you probably have a Japanese student postdoc or colleague. Please take a look. There are so many different problems, many serious even taken alone, that it’s hard for me as an outsider to your field to believe there’s not a pattern here. What do the pros think? The enfolded sac behind the placenta (disc) is the yolk sac. When different pictures of the same placenta in different positions are taken, the yolk sac almost never look the same as it is a very flabby tissue. In contrast the placenta is much more rigid and the pattern of GFP expressing cells would be as a fingerprint. Thanks for addressing that point. As far as I can see, that leaves us with various indications of sloppiness on the part of the authors (some of which has now been acknowledged) but nothing that clearly indicates fraud. The above and some related verbiage was apparently copied and pasted without attribution from Guo et al. (Vitro Cell Dev Biol Anim. 2005 Sep-Oct;41(8-9):278-283). Obviously this is improper. More seriously, the CDB unit of Riken was started in 2001 or so and Dr. Obokata’s lab in 2010 or so. On the other hand, the equipment and software mentioned by Guo et al. in the passage copy-pasted by Obokata et al. dates back to the 1990s. It is hard to believe that she and her co-workers would have used such obsolescent hardware and software. If they did, they could dispel all doubts on this point by taking reporters to the room where this equipment is located. The fact that they haven’t done this raises obvious questions about whether or not the work discussed in the Obokata et al. paper was actually performed. I’m saying this as a complete outsider (my field is seismology). How do workers in this field view this matter? I respect your sincere attitude and all your effort to uncover stories behind this incidence, Dr. Knoepfler, but “I trust him because he is a trustworthy researcher” (that’s how I read) is not very scientific of you. Yes, I agree that Dr. Wakayama did some significant work and I also respect the fact that he responded all those questions (if not with satisfactory levels of details), but that does not mean that we all should believe what he said without any evidence, especially given this situation. What strikes me strange is that he doesn’t say that he will demonstrate and reproduce the results by himself. For example, he can easily invite external researchers and show that what’s written in the paper is correct. Why doesn’t he do that, and suggest all of us to wait for a year? If, for some reason, it is very difficult to do for him, why doesn’t he suggest that Dr. Obokata will reproduce the results in front of external researchers instead? Moreover, what if someone actually successfully produce STAP stem cells within a year? I mean, should all the credit go to Obotaka et al? I think it should be so only if this reproduction is done by following the exact procedure as written in their paper. Otherwise, I can claim that I made a time machine and describe a method that does not work in practice, and later, if someone actually made one, I can get all the credit, which seems utterly wrong. Thomas, you make some valid points. As senior author on one of the STAP Nature papers and an author on the other one, it is clear he is deeply tied to the overall STAP situation. I think he knows that. of the kind of PR blasted out by Riken when the Obokata et al. papers were first published in Nature. The video features a short clip from her press conference and some staged shots of her working in the lab, playing with her pet turtle, and so on. As you can see, Dr. Wakayama features prominently in this video. So, for better or worse, I think he has set himself up to take a major part of the credit if STAP cells ultimately are validated, and conversely, to take his fair share of the blame if they don’t. I hope you’ll also take a look at this, together with a Japanese speaker from your lab or department, if there is one. I watched it without understanding Japanese. It seems to me they are excited and proud of the work. You are right, Bob, that Wakayama is strongly linked to STAP. Again, I felt it was important to give him an opportunity to talk to people here about his views of the situation and what has happened. I’m a layman at this area. from my understanding, as for Dolly, it’s the Practical Technology/Method that needs time to learn and practice so others can repeat it . But I did not see any Practical Technology or Method which is as hard as (Dolly’s case) to be learned in STAP. I think they’re protocols without new or complicated technical/practical problems? Or is there any new?